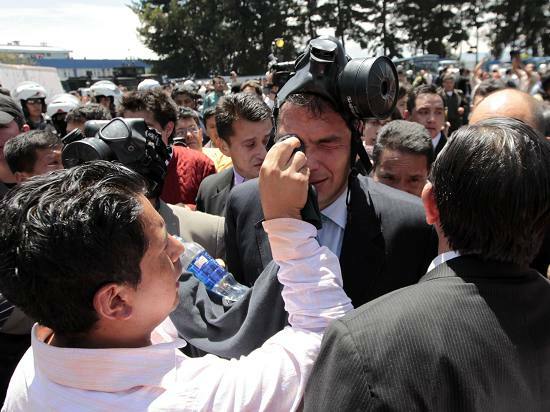 News channels and radio stations on Thursday night dramatically reported a siege - apparently maintained by a number of insubordinate policemen - of the Quito hospital where Correa was being treated for injuries caused by a tear gas canister thrown at him while he addressed protesting policemen in their barracks. Earlier, soldiers had occupied the runway of Quito’s international airport, forcing its closure, while the country’s main highways were blockaded by other members of the security forces, angry at the implementation of the Ley de Servidores Públicos (the Public Servants’ Law – LSP), a new law which would signal 80,000 redundancies for their sector, as well as affecting their benefits and promotion bonuses. As the crisis continued into the night, and with almost all of the police and military absent from work, Ecuadorians started to barricade themselves in their homes with only the television for company. Internationally, commentators tut-tutted at the seemingly endemic political instability in Ecuador and yet another coup in Latin America. Comparisons were made with the Doce de abril failed coup against Hugo Chávez in Venezuela eight years ago, and the so-called Pyjama Coup in Honduras last year, which saw President Manuel Zelaya - another anti-imperialist poster boy - removed from office at the dead of night. Eventually, in the small hours of the morning, the tension reached fever pitch as loyalist military personnel attacked the uniformed individuals surrounding the hospital, killing two in the process, and extracted their President, who promptly vowed revenge on the rebellious police officers - the “locos” and “golpistas” who had attempted to “kill him”. However, as the dust settled on a failed coup and business slowly started to resume as usual in the nation’s capital, questions started to be asked, doubts raised. The facts may never all emerge, and those that do will probably be buried under the weight of the continuing farce of Ecuadorian politics, but slowly but surely, Ecuadorians are starting to find holes in Correa’s version. The doctors who treated him now deny that he was, as he claims, “kidnapped”, asserting that they actually tried to discharge him twice, only for the President to insist on remaining inside the hospital. Moreover, it appears that a delegation of high ranking policemen actually visited Correa at his bedside to attempt to negotiate a solution, and that even when Correa refused to exempt the police from the LSP's consequences - which include involuntary redundancies for some 260,000 public sector workers (half of which being teachers), and with reduced pensions in government bonds for those who are forced out - they agreed to organise his safe departure from the hospital. Of course, even if Correa were “trapped” inside the hospital while a coup d’etat was in full swing outside, then his actions on Thursday itself surely played their part. The security forces’ strike is following on the end of years of popular struggle against the Correa administration, who has seen previously loyal public sector workers, students and indigenous groups all mobilise against the increasing deregulation of the Ecuadorian economy and simultaneous austerity measures, while his proposals are being blocked in the Asamblea Nacional by members of his own Alianza País party, conscious of their nosediving popularity. Ecuador has been defaulting on its debt repayments of late, and is having to tighten its belt as a result - a strangely familiar story across the political spectrum in the unstable global economy of 2010. Upon hearing of the police officers’ protest inside their barracks on Thursday morning, Correa arrived to address them, but far from the conciliatory tone and talk of compromise that you might expect from someone facing down hundreds of furious, armed cops, he attacked their supposed betrayal of him before bizarrely imploring them to “kill him”. Following his injury, Correa was transferred to a police clinic, only 300m away from the rioting cops, hardly a safe haven for someone claiming that his life was at risk. On the face of it, last Thursday’s events can be attributed to the fragility of Ecuador’s ruling class, which saw four Presidents in a month in 1997 and a successful coup as recently as 2005, while Correa’s actions can be described as a sort of populist brinkmanship, playing to the audience in a region whose heroes are principled martyrs and gallant gentlemen in melodramatic telenovelas. However, a more cynical observer might suspect a more farcical element to this crisis. On Thursday night, with the country fearing the seizure of power by a military dictatorship, Correa declared a state of martial law from within the hospital and threatened to extend it until the next elections, which would mean dissolving the Asamblea and ruling by decree in the meantime. Upon announcing that a coup d’etat was already in progress against him, all Correa would have had to have done is sit tight and wait for the reactionary right – both inside and outside of Ecuador – to indicate their support for any potential golpistas in Quito, thereby justifying his radical response and guaranteeing the mobilisation of the nation behind him as the democratically elected leader against would-be dictators, a la Chávez in 2002. In the meantime, ruling by decree would have represented a convenient solution to the dissent within Correa’s own party ranks against his austerity measures, dissent which he had fortified via a succession of executive vetoes to pass legislation. Nevertheless, if Correa’s plan was to induce and/or fan the flames of a failed coup against him as a means of consolidating his support, then the reactionary right were unwilling to act in his stage-managed theatre. While the likes of Chávez and Bolivian President Evo Morales postured against the right wing, the US and its disregard for due democratic process, Correa’s political enemies inside Ecuador publically denounced any attempts to unseat him, and they were quickly joined by Peru’s ultra-right President, Alan García, and even the US Secretary of State, Hillary Clinton. If there were indeed any murky political players looking to overthrow Correa, they weren’t declaring their intentions publically. With no Pedro Carmona figure against whom to unify the country, Correa had to drop all talk of dissolving the Asamblea upon leaving hospital. In fact, the whole episode has represented a huge defeat for the incumbent President and his austerity measures. His callout to the Alianza País faithful – who once mobilised in their hundreds of thousands –elicited a mere thousand or so supporters willing to save his life outside his hospital, while the pro-Correa demonstration in Quito was dominated by highly paid civil servants who fled after clashing with striking policemen (they were worried about leaving their 4x4s parked out there, one commentator later joked). And when the country’s union members and student movements finally emerged - burning tyres on the streets of Ecuador’s major cities - their chants were against the LSP (which, after all, affects all state employees, not just cops), the casualisation of labour and cuts to universities. In the confusion in Cuenca, students somewhat ill-advisedly joined a police plantón (protest camp) outside the state government headquarters. The country’s indigenous groups also took the streets, balancing their opposition to Correa’s cuts with an opposition to any external intervention in the government. Indeed, as the international discourse turns away from the supposed insubordination of the police and back towards the hugely unpopular cuts of Correa’s administration, the regime has been forced to backpedal, and is now promising to revise the LSP - at least as far as the security forces are concerned. If the police and military are to be ringfenced from austerity – despite their salaries being over twice the average national wage – then one must expect that the Ecuadorian working class at large will escalate their struggle against cuts to their wages and services by a government whose leftist rhetoric about wide-ranging social programmes is being contradicted by its commitment to not default on its debt repayments for the second consecutive year and thereby improve its credit rating with the world’s banks. There is already much social conflict in the country: social movements are still resisting the attempted privatisation of the nation’s water supply, indigenous communities in the Amazon are fighting against petroleum companies, while communities in the southern Andes are resisting the encroachment of mining corporations. All in all then, with Correa safely back in his Palace, a lasting conclusion of this curious chain of events – beyond speculating as to the ‘real events’ of last Thursday night – has to be that despite the lazy tendency of international news media to revert to well-worn narratives about coups in Latin America against their ‘colourful’ leftist Presidents, the one cliché that actually does seem appropriate is the one which equates them with leaders in the rest of the world - that of the subservience of all political regimes to international economic reality. Hey, a really interesting article, thanks for posting it. It does appear that this "left wing" President is attempting to garner working class support to carry through his austerity programme by conjuring up this right wing bogeyman, when in fact he is doing the same as they would anyway. One quick thing though about the text: the LSP isn't really explained anywhere - reference is made to a "Controversial law" towards the top of the article, and to the LSP later, so it might be worth editing in a quick explanation. Analysis focussed on Latin America, and casual work in London.